On a lightly floured surface, roll dough into a 12 inch circle, about 1/8 inch thick. Transfer to a 9 inch deep dish pie dish, letting dough fall into place. Trim dough edges to ¼ inch past rim of pie dish. Fold edge under so it fits on lip of pie dish. Cover with plastic wrap, and refrigerate for 30 minutes. Prick bottom and sides of pie dough with a fork. Bake until edges are pale, 12 to 16 minutes. In a small saucepan, cook butter over medium heat until it turns golden brown, about 8 minutes. Remove from heat. Set aside. In the work bowl of a food processor, combine almond paste, 1 cup sugar, and eggs. Blend until mixture is smooth, about 3 minutes. Add topioca flour, salt, and reserved vanilla bean seeds, blending to combine. With motor running gradually add brown butter, and process untils mooth. Add sour cream, and blend until smooth,a bout 2 minutes. Pour batter into prepared pie shell, place apricot halves on top. 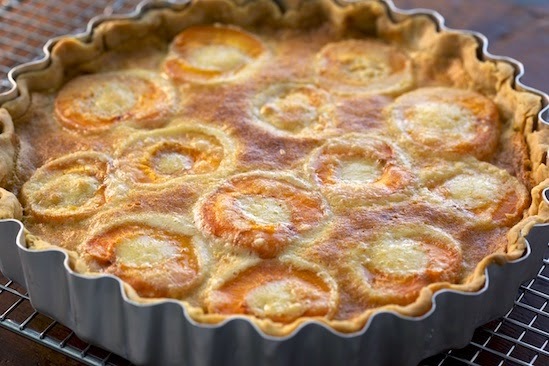 Place pie on a rimmed baking sheet. Bake until custard is set and just slightly brown around edges, 30 to 40 minutes. Transfer to wire rack, and let cool for at least 2 hours. Refrigerate until set, at least 1 hour. Ina small saucepan, combine remaining ¼ cup sugar and ¼ cup water. Bring to a boil over medium high heat. Remove from heat; let cool slightly. Using a pastry brush, brush syrup over apricots before serving.